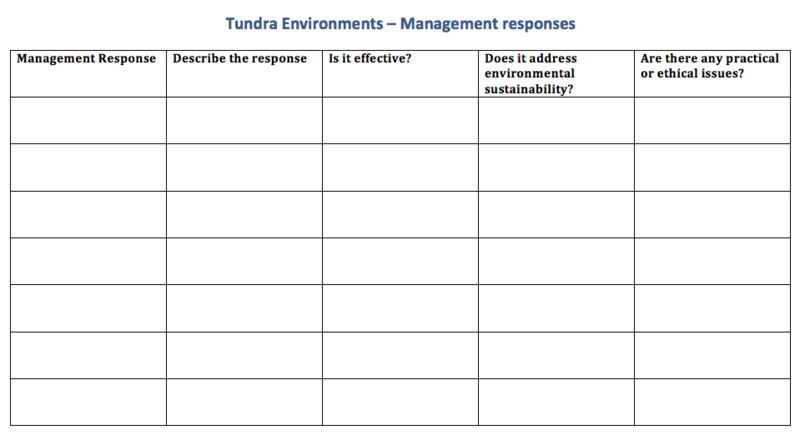 Evaluate the effectiveness of management of environmental change in tundra environemnts. You will need to make a judgement about the benefits and costs of management strategies implemented. How effective are the management strategies? How can communities and governments attempt to balance environmental, economic and social criteria? To what extent can there be trade offs between them? What are the practical and ethical dilemmas of national and international conservation programs? Are the management strategies addressing environmental sustainability? In your response to this question you will need to describe the management strategy, and make a judgement about how effective it is. Use terms such as totally ineffective, somewhat ineffective, moderately effective, very effective. Print and complete the scaffold below to help you complete your extended response.